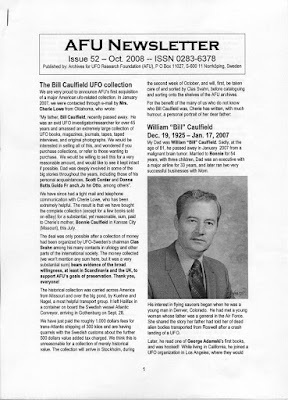 If anyone deserves the title Mr. AFU it is my old friend and UFO research collegue Anders Liljegren. The truth is that the archive would never have achieved its present dimensions and renown if it hadn´t been for the persistent determination and idealism of Anders. He is the rock of AFU, working today full time as administrative manager at the archive instead of spending lazy days as a pensioner. While my AFU commitment has had its ups and downs Anders has always steadfastly, through all the years, kept the torch burning since our foundation in 1973. That´s impressive. 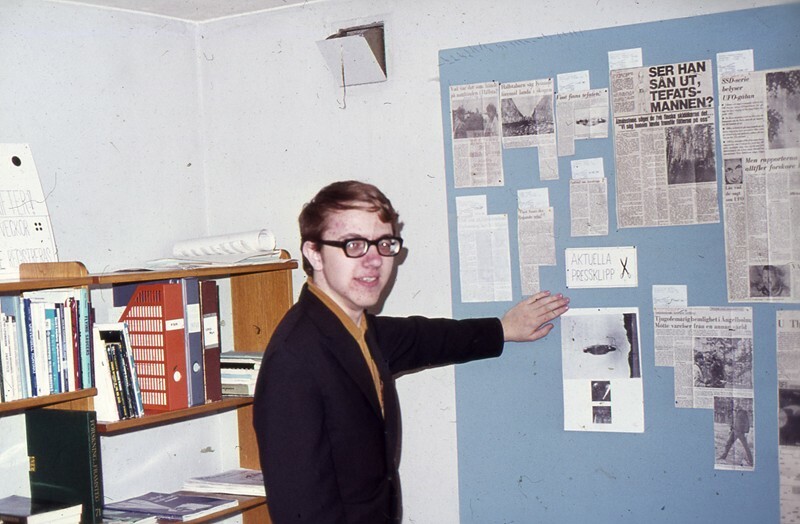 Already in 1969 Anders began taking an active interest in ufology, placing an ad in the local paper, looking for UFO interested people. 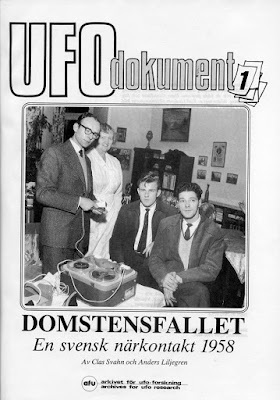 A small informal group was formed, When the national organization UFO-Sweden was founded in 1970 the group was renamed Norrköpings UFO-förening (Norrköping UFO Society) and they had a small habitat not far from the present AFU premises. 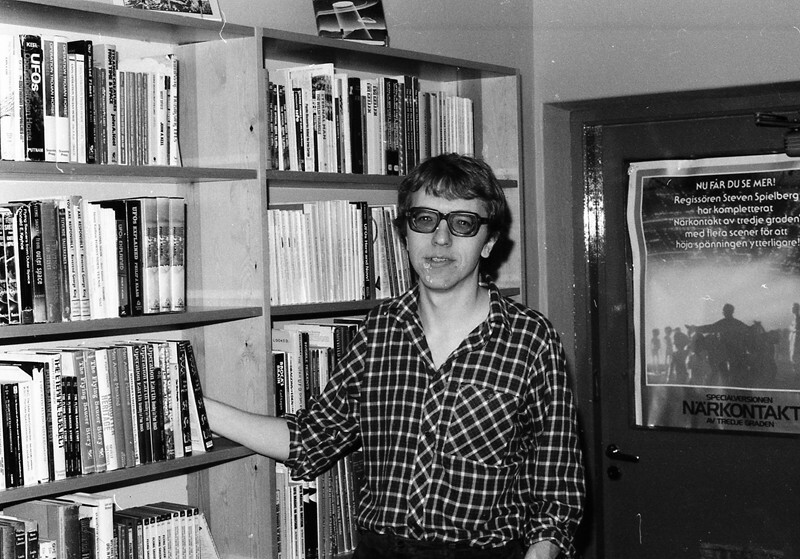 I met Anders for the first time in January 1971 when entering senior high school studies at Norrköping. 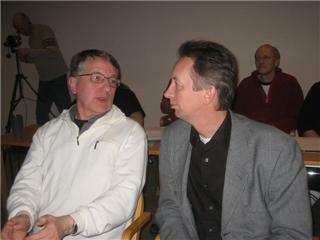 We had both of us founded local UFO-Sweden groups and soon became good friends. Already from the beginning Anders was the down-to-earth practical realist in UFO matters and when I now and then went too far out on a limb in the UFO and paranormal world, Anders pulled me back with his critical common sense. Anders at home, February 7, 1971. He never liked being photographed. In the autumn of 1972 we both became discontented with the ideology and public image of UFO-Sweden, which was at this time very much information, or ET missionary, oriented. Inspired by Jacques Vallee and John Keel , we wanted primarily to do serious research. So in March 1973 Anders Liljegren, Kjell Jonsson and I started an informal working group, Arbetsgruppen för ufologi (AFU), The Studygroup for Ufology. This eventually developed into a library and archive institution which was very much Kjell Jonson´s inspired and brilliant idea. Among the first research projects initiated by Anders was an in depth study of the 1946 Scandinavian Ghost Rockets wave and the very intriguing reports of Ghost Fliers in the 1930s. In 1977 Anders received permission by the Swedish Minister of Defence, Eric Krönmark, to study the so far classified files on the Ghost Fliers at the Military Archives in Stockholm. 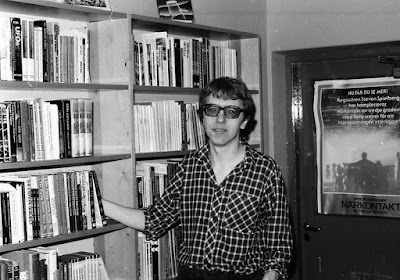 In 1975 I had started publishing AFU Newsletter, a venture that Anders continued from 1976 until 2008, all in all 52 issues. All issues can be downloaded at the AFU website. The AFU acronym was changed to Archives for UFO Research in 1979 and we became a formal foundation in 1980 when we also moved to our new premises in Norrköping. From now on Anders Liljegren and Sven-Olov Svensson continued the daily maintenance at the archive. 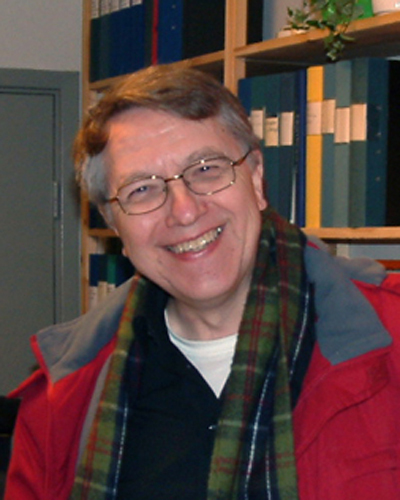 In 1983 Anders designed the first version of our own classification system, Ufocode (later PhenCode), built on mnemonic codes and still in use although very much updated and expanded. Anders´magnificent idealism was exemplified in 1985 when he, from his own economic resources, bought the first AFU computer an IBM-compatible XT at the cost of 50.000 SEK. With the help of this computer he created the first database on Swedish UFO reports, ScanCat. In 1984 Clas Svahn from UFO-Sweden joined the AFU board. UFO-Sweden had in the 1980s become more research oriented and in 1986 AFU became officially affiliated with our national organization. A pioneering research effort was made by Clas and Anders in 1989 with the publishing of Domstensfallet: en svensk närkontakt 1958 (The Domsten Case. A Swedish close encounter 1958). With meticulous documentation they could prove that this classic Swedish abduction was a fake. 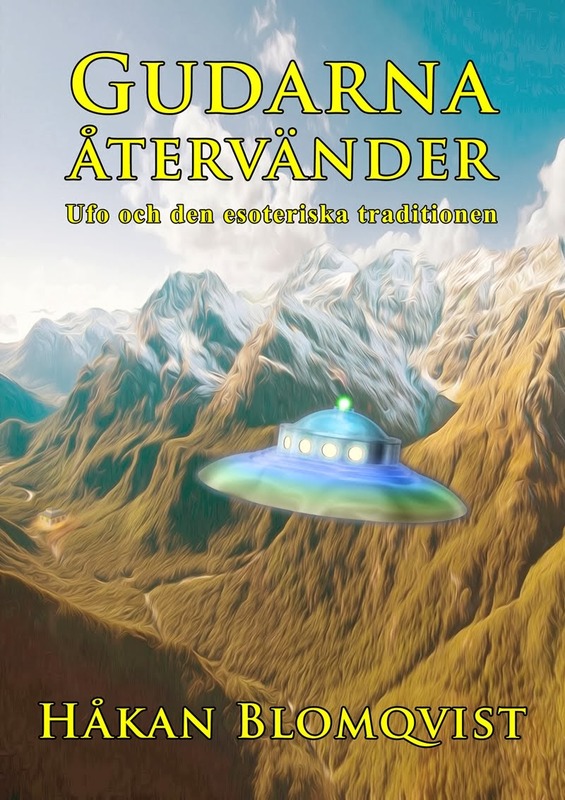 This represented a new ideology in Swedish ufology, what later came to be called the third way ufology: neither naive belief nor debunking skepticism but an open mind to various theories and claims based on critical investigation and empirical data. 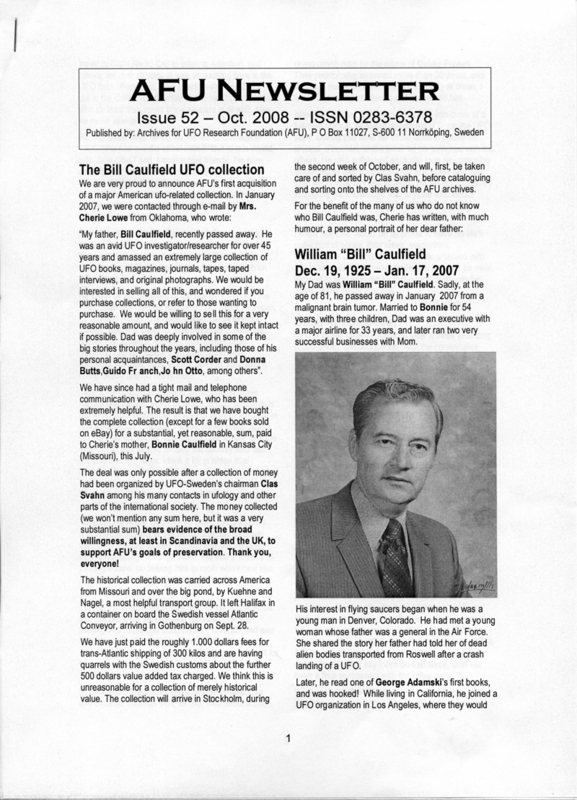 Beginning in the 1990s AFU received an increasing amount of donations of UFO and Fortean books, periodicals, correspondence and organizational files from all over the world. And it was Anders who worked diligently cataloguing all the incoming collections. 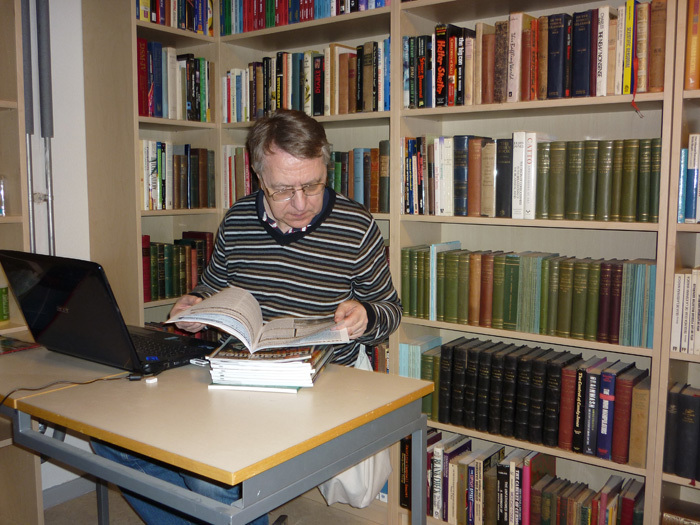 A very usual sight at AFU is Anders at his desk comtemplating some tricky cataloguing issue. The catalogue on serial publications today includes more than 73.000 individual issues from 57 different countries. The book catalogue comprises around 26.000 titles. Today Anders is the principal manager and executive at AFU, taking care of economy and personnel. With 12 premises and a staff of around 15 people his working day can be quite intensive. 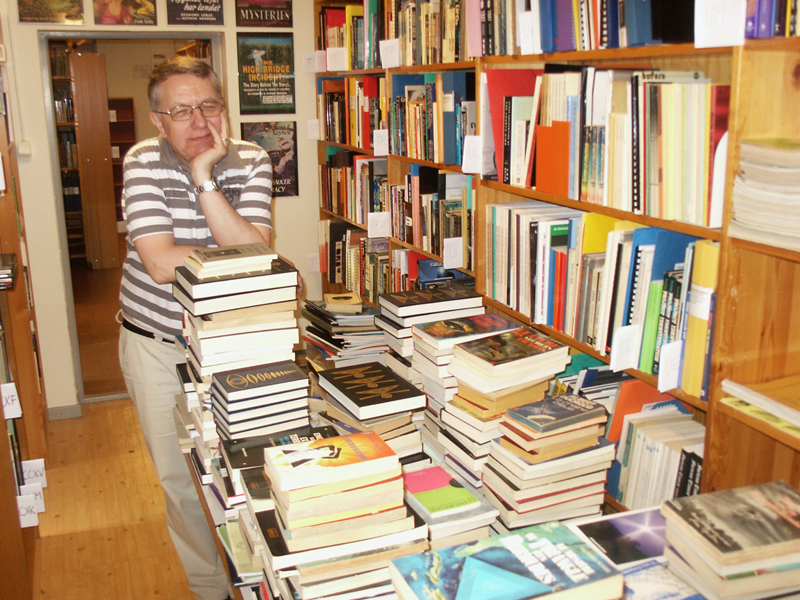 The continuing inflow of books and other material to AFU sometimes makes Anders feel like he is buried in books. Especially when Clas Svahn (The Viking Raider) has found another collection donated to AFU. When relaxing from his AFU undertaking Anders engage in his special interest in maritime and aviation history. 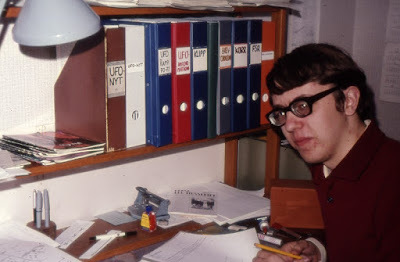 Anders Liljegren and I have been research colleagues and good friends since 1971, sharing many memories of both hard work and happy times with UFO collegues. Keep up the good work Anders! On October 8, 2016 my wife Margaretha and I attended a very interesting and inspiring lecture, Konsten, poesin och sanningen (Art, Poetry and Truth) at Kristinehamn Public Library. An excellent exposition of how ideas from the Esoteric Tradition inspired the famous Swedish poet and writer Gustaf Fröding. The lecturer, engineer (M.Sc.) and writer, Rolf Solheim has spent several years investigating och documenting the worldview of Gustaf Fröding. A pioneering research effort that will add a whole new dimension to our national poet. In several blog entries I have mentioned that Värmland is the Swedish province par excellence of poets, authors, artists, mystics and esotericists. A province also rich in folklore on nature spirits, paranormal sites and phenomena, including many UFO encounters. Therefore it comes as no surprise to find that Rolf Solheim and his wife Anne have their home at Arvika, Värmland. From the same magical province comes Gustaf Fröding, world famous author Selma Lagerlöf and artist Gustaf Fjaestad, all of them inspired by the Esoteric Tradition. 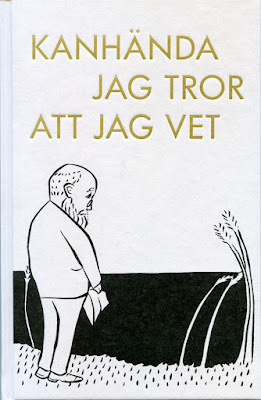 A summary of Solheim´s research on Fröding was recently published in the yearbook 2016 of Gustaf Fröding-sällskapet (Gustaf Fröding Society): Kanhända jag tror att jag vet (Maybe I believe that I know). 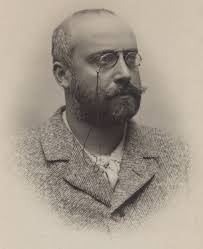 Solheim writes that he was surprised to find that hardly any academic scholar has made a study of or understood how Fröding´s esoteric worldview was reflected in his writings. 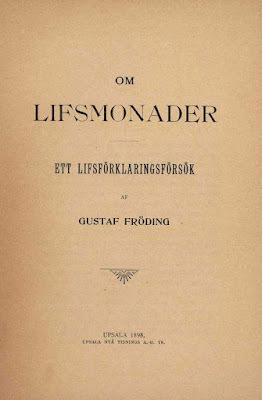 Gustaf Fröding had in 1898 privately published a small booklet, Om lifsmonader. Ett lifsförklaringsförsök (On lifemonads. An attempt to explain life). In his 1916 biography on Fröding, Swedish literary scholar and professor of Pedagogy and Psychology John Landquist regarded this booklet as "a curiosity, caused by Fröding´s mental illness", implying "reduced capacity for reasoning power", and "a low point in Fröding´s production". This assessment is ample evidence that John Landquist, like most contemporary academic scholars are esoteric illiterates, with very little knowledge of esotericism as the third pillar in cultural history, along with science and religion. Fröding´s booklet Om lifsmonader is a remarkable document on esoteric philosophy, especially when we know that it was written by a man who spent a large part of his life in various hospitals because of mental illness and alcoholism. The life of Fröding was an endless journey of sickness, pain and loneliness and still he could write the most beautiful and inspiring poetry, a timeless gift to new generations of readers. Accomplished esotericists reading Om lifsmonader will immediately recognize reflections of the Ageless Wisdom. With the hypothesis on världsharmoni (World Harmony) presented in his booklet Fröding aimed at creating "a bridge between the materialistic worldview and the trancendental". He envision a cosmic evolution in a multiverse of seen and unseen worlds where the smallest units are named monads, in constant movement and development of consciousness, leading to higher forms of life, above man. At the end of the booklet Fröding acknowledge Theosophy as one of his sources of inspiration. 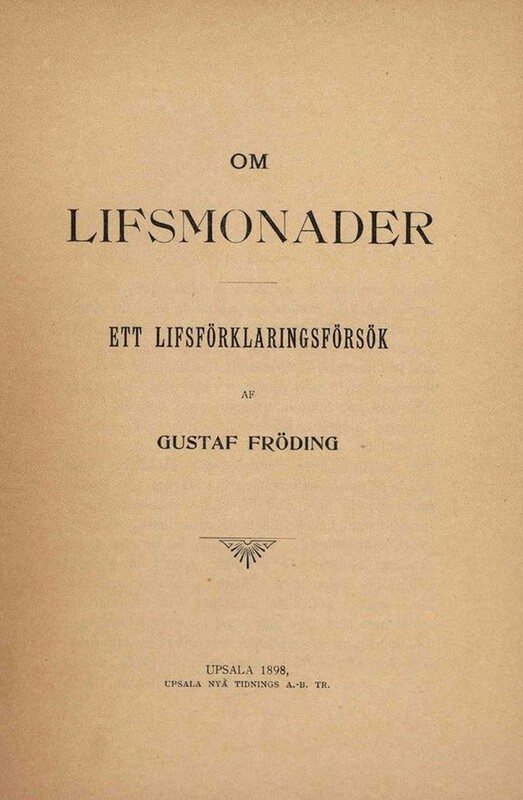 Om lifsmonader was published in 1898 but Rolf Solheim relates how Fröding already in an article from 1892 had formulated his worldview: "The religion of love and freedom is the oldest of all religions and has inspired the noblest and best of men as long as there are historical records... its main features are always the same, the service to give unto others of the best you wish for yourself and the knowledge that this is the only way to happiness together with the drive to search for the highest truth and beauty... and the courage to proclaim and work for the ideas you have found..."
The literature on Fröding is immense and many studies have been made of his life, poetry and mental illness by various authors, among them several psychiatrists. With the renaissance of academic interest in "Western Esotericism" we will hopefully see more studies on how the Esoteric Tradition influenced Fröding. As to mainstream psychiatry Rolf Solheim has little hope: "Unfortunately Swedish psychiatry still lack open mindedness when it comes to transpersonal or metaphysical man or a psychology and therapy that can accept that Plato´s world of ideas is in fact a reality." Academic scholars have for several years been studying the esoteric influences in the writings of Selma Lagerlöf. Next in line for this type of research is Gustaf Fröding and Gustaf Fjaestad. Here the pioneering research of Rolf Solheim will be of great help and value.